Virtual reality (VR) technology has improved significantly in the last few years. 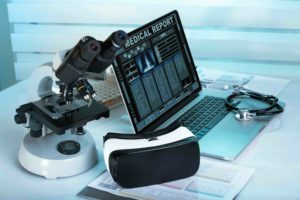 With these advancements, the use of VR in the clinical setting is increasing. There are many cited uses and benefits, including rehabilitation, pain management, and reduced feelings of anxiety, depression, and isolation. However, it is important to avoid unsubstantiated claims, establish protocols, and to seek validated and tested VR software and hardware. While all three authors stress the need for further research to be conducted; they attest that these recommendations, based on years of observation, are a good starting point for those who are considering the adoption of VR in their clinical practices. 1. Mitigate the risk of simulation sickness by deploying professional grade virtual reality technology. 2. Select hardware that can withstand the use of hospital grade germicidal wipes and consider the use of VR covers. 3. Assess patient physical and mental state prior to administering VR. 4. Screen for patients with pre-existing conditions of motion sickness, dizziness, or lightheadedness. 5. Make sure the patient knows the risks and potential benefits and provide demonstrated instructions prior to the patient taking on the full experience. 6. Ensure the VR headset fits the patient, is not too tight or heavy, and adjust the focus of the VR headset. 7. Children or adults with significantly reduced physical or mental capacity should be supervised, including when VR is used in conjunction with narcotics or other strong medications. 8. Limit VR usage to 60 minutes at a time and take breaks between sessions of at least 10–15 minutes. 9. Provide the patient with a way to signal if they encounter problems and encourage them to do so. 10. Monitor patients for potential problems. Keep an eye out for a patient’s involuntary muscle twitches, reaching to grab onto something that they can stabilize themselves on, loss of balance, growing frustration or anxiety.